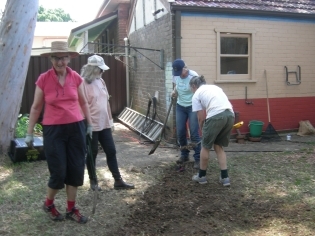 In November 2010, in partnership with Marrickville Council and enthusiastic local residents, Equatica built a small raingarden in a back yard in Dulwich Hill. 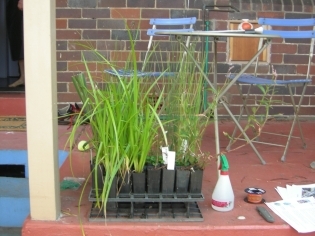 Marrickville Council advertised and organised the project as part of their Environmental Workshop Series, which also includes "Water Sensitive Urban Design on Your Property" workshops. More information is on Marrickville Council's website. 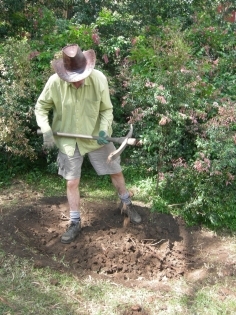 This page steps through the process with lots of pictures; it's intended as a basic guide for anyone interested in constructing their own backyard raingarden. To complete the design, we also did some more detailed measurements on site. 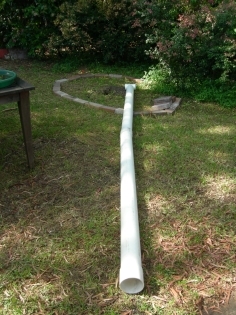 The plan was to divert water from an existing drainage pipe collecting water from the roof and driveway. 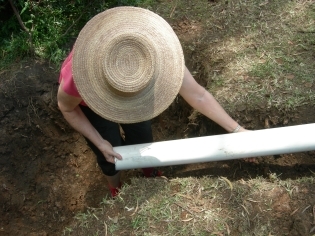 We extended the drainage pipe by a few metres to direct water to the raingarden. Treated flows from the raingarden are infiltrated into the surrounding soil and in large events the raingarden overflows into an existing garden bed planted out with lily pillies. 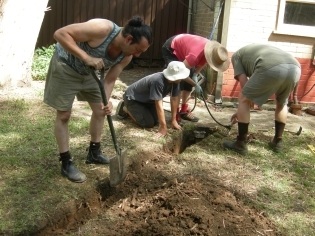 We used simple household tools including a mattock, shovel, hacksaw, wheelbarrows, a crow bar and some hand tools. A tape measure and spirit level were also useful. 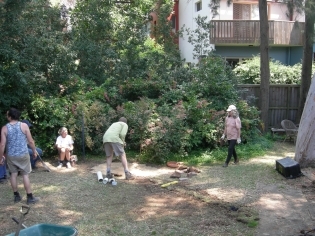 Construction started with the excavation of the trench to divert the roof water and driveway drainage into the raingarden. 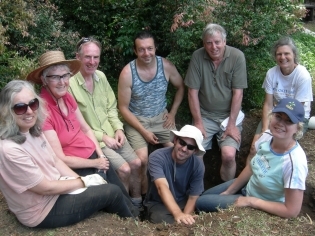 At the same time we started to excavate a hole, 2 square metres in area and 600 mm deep, for the raingarden. 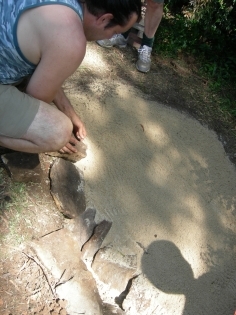 We carefully exposed the existing outlet for the stormwater drainage. 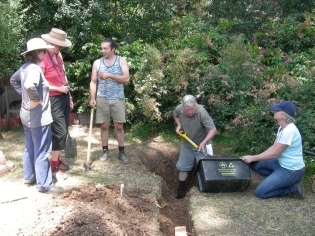 We connected new fittings to the outlet so that it could be extended into the raingarden. 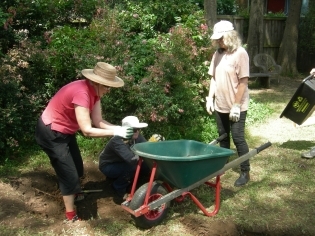 Meanwhile we continued digging the hole for the raingarden. 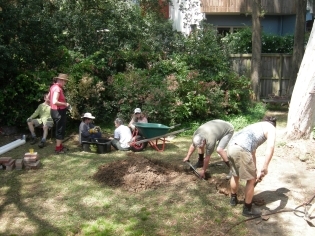 After a while the excavation started to take shape - this photo shows the diversion trench (on the right) and the excavation of the raingarden (on the left). 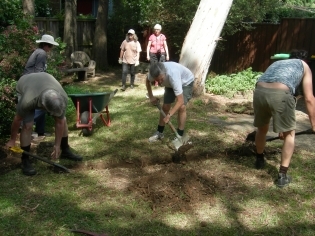 Excavating the hole for the raingarden took the most time - mainly because it was slow going excavating in stiff clay. 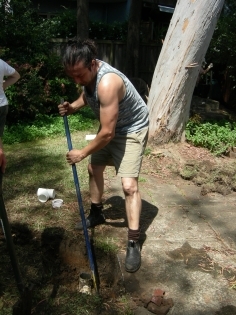 We used a mattock to break up the clay and then shoveled it out. We connected the final pieces of the diversion pipe and cut the pipe. 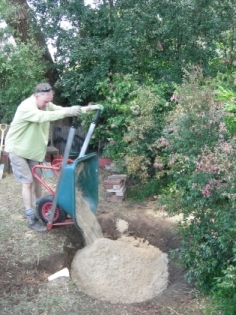 Next we started filling the raingarden with the filter media - a single washed sand. 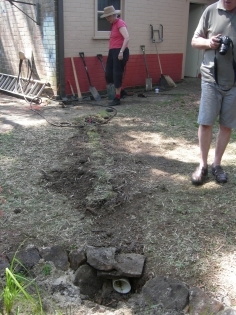 ...and relay the turf which we had stockpiled to place back on top of the diversion pipe. 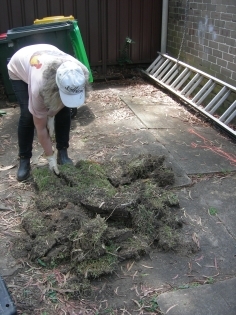 We started to level off the filter media and prepare the raingarden for planting. 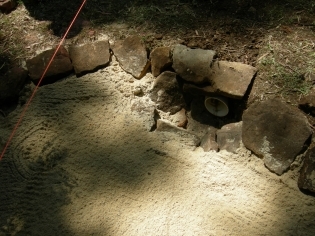 We placed sandstone pieces around the raingarden to provide a landscaped edge. 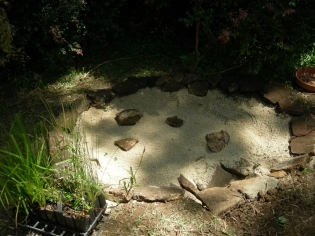 We also constructed a small stilling basin and rock scour pad at the inlet into the raingarden, using sandstone pieces. Finished raingarden prior to planting. 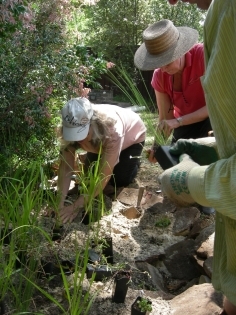 We planted out the raingarden. 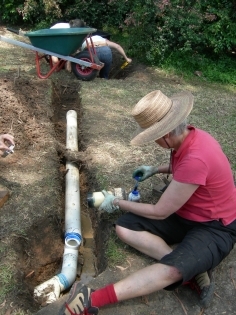 We flushed out the inlet pipe and tested the raingarden by pouring water down the pipe. 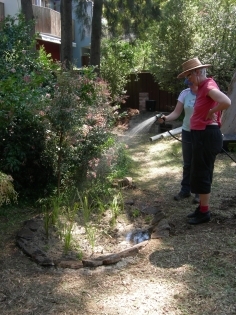 Finally we finished by watering the new plants. Thanks to all who made it such a great day, with a special thanks to Gayle Adams and Jean Brennan. 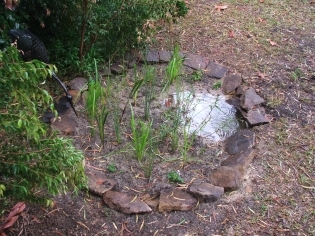 This final picture shows the raingarden during its first rain event.